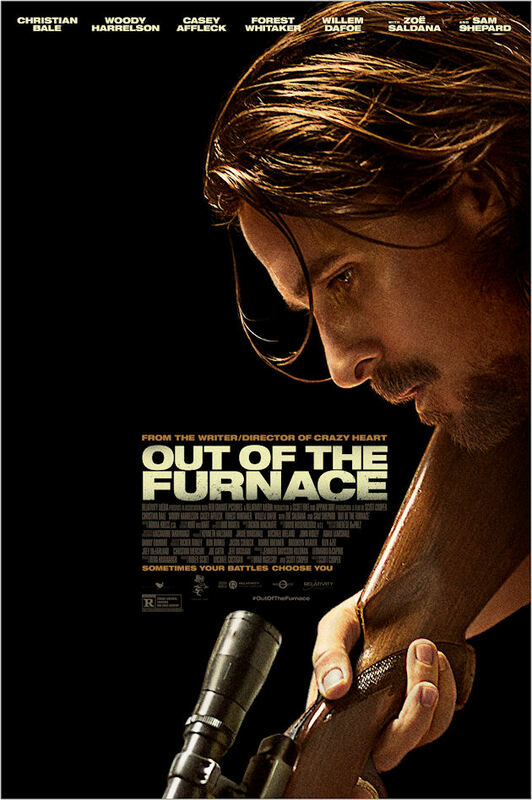 With snow on the way, today seemed like a good time to see “Out of the Furnace”. In a follow-up to his first feature, Writer/Director Scott Cooper (“Crazy Heart”) takes us to a Pennsylvania steel town. It’s the story of two brothers who are raised the same way but turn out different. Yet, they are still brothers. Their father gave his life to the mill, and Rodney (Casey Affleck from “Ain’t Them Bodies Saints”) wants none of that. After four tours in Iraq, he still cannot find a way out of this town. His older brother, Russell (Christian Bale from “The Fighter”) accepts the mill as his life and he accepts his role of keeping his younger brother out of trouble. In this town, trouble can be found at the hands of John Petty, (Willem Dafoe from “John Carter”) the gangster in residence. When Russell has to “go away” for awhile, Rodney goes to work for Petty who has a soft spot for the kid. The big bad wolf in this story is Harlan DeGroat, (Woody Harrelson from “The Hunger Games”) who lives with the other inbreds in the mountains of New Jersey. Who knew they had those in Jersey? Mountains, that is, and not all mountain people deserve a reality TV show. Scott Cooper milks everything he can out of this story and the under-whelming backdrop of a dying steel town. I think there were only three shots in the movie that did not have a smoke stack, a train track, a mountain or a grave yard. Add to that the caterwauling of Eddie Vedder, and you wonder if these boys are ever going to get out this pearl of a jam. The movie was a bit slow, but more like movies of the seventies where you get to find out about characters and what makes them tick and stick around a place like this. The plot gave more than a nod to “The Deer Hunter” (Michael Cimino – 1978) along with a great supporting cast. This movie is about brothers, and when something happens to your brother, you can’t let it go. You have to follow it “all the way to the end.” There is no perfect ending, but then it’s not a perfect world. That must mean that I cared about these people. That makes it a pretty good movie. Good enough for 3 ½ stars out of 5. Now I gotta call my brother.